For our tablescape, we chose to use mixed metals—warm rose gold for the chargers and flatware, bright gold details on the dishes, and antiqued silver on the napkin rings. Don’t be afraid to mix the place settings—our dinner plates, bread plates, and soup bowls were all from different dish sets, with the color scheme tying them together. If that sounds risky, just remember this simple rule to keep your table from feeling cluttered: choose one small-scale pattern, one large-scale pattern, and one solid color plate. 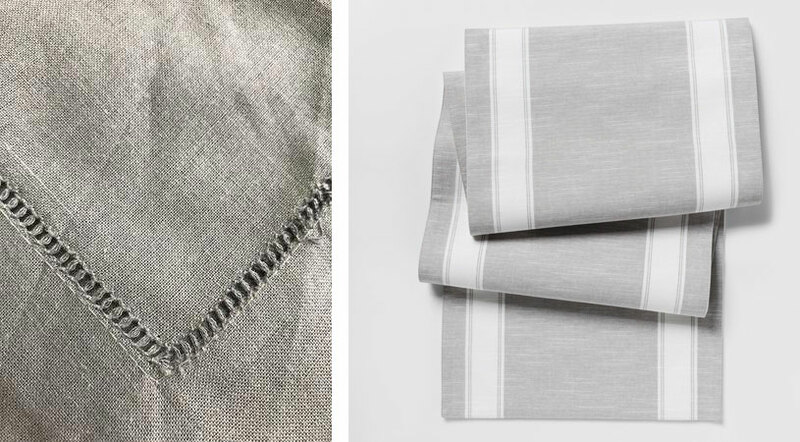 Soft gray linen napkins and the table runner act as neutrals set against the warm wood farmhouse table. Rather than splurging on an entirely new set of dinnerware and decor, consider renting items from your local event rental store. We headed to FESTIVE FARE RENTALS in Charlottesville, VA, who provided us with the dishes, flatware, wine glasses, and linens. You’d be surprised at the wide assortment of designs and styles. 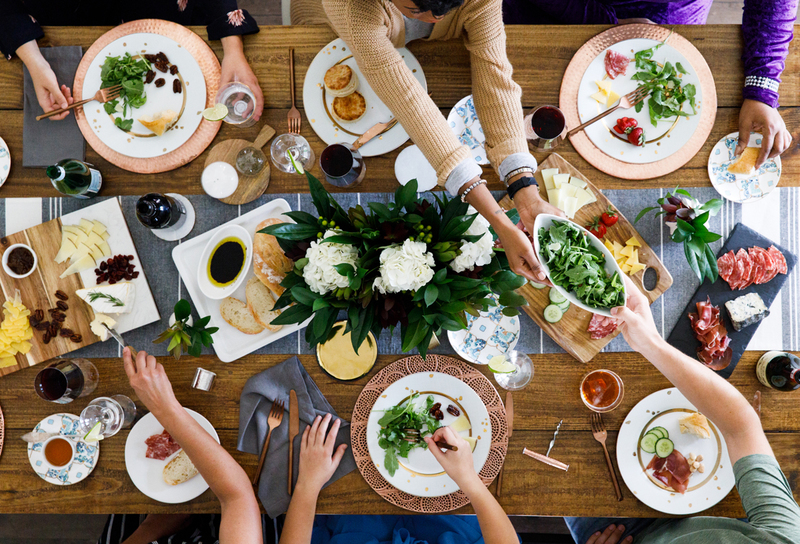 This rental option allows you to mix and match according to the number of people you’re hosting and the specific dishes you’re serving. And the best part? You can skip the dishwashing— they do it for you! Then head to a local boutique, like ROXIE DAISY in Charlottesville, VA, to add a special item or two to your table, like this beautiful scallop casserole dish or brass tip salad servers. If you add just one quality item a year, you’ll wind up with a lovely collection without overspending. 1. CHOOSE YOUR VESSEL – Mimic the shape of your table—a rectangular container works well on a rectangular table, a round vase works well on a circular table. 2. BUILD A FOUNDATION – Place a floral foam brick inside your container, cutting down to size as needed. Using floral tape, create a tic-tac-toe pattern across the top of your container. You will place the stems through the grid and into the foam, helping them stay put. Add 2” of water. 3. GREENS – Starting at the bottom, place dark leafy greens in various hues. 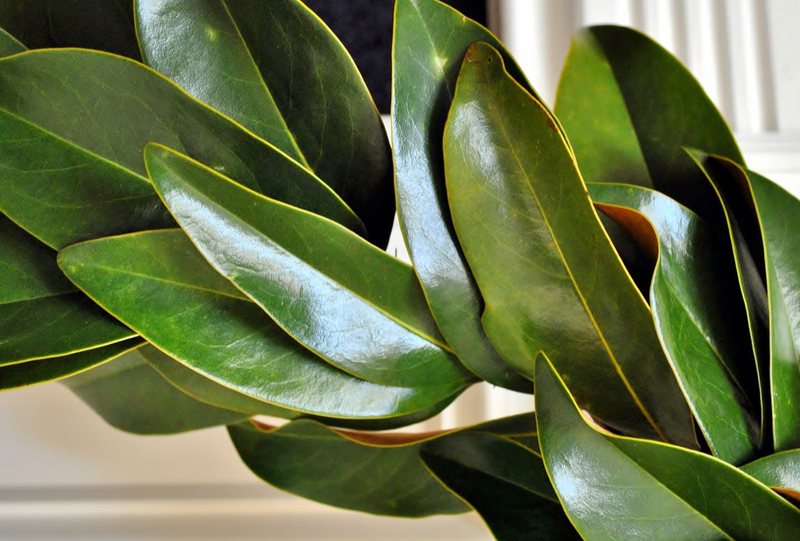 Magnolia leaves are our go-to green. 4. 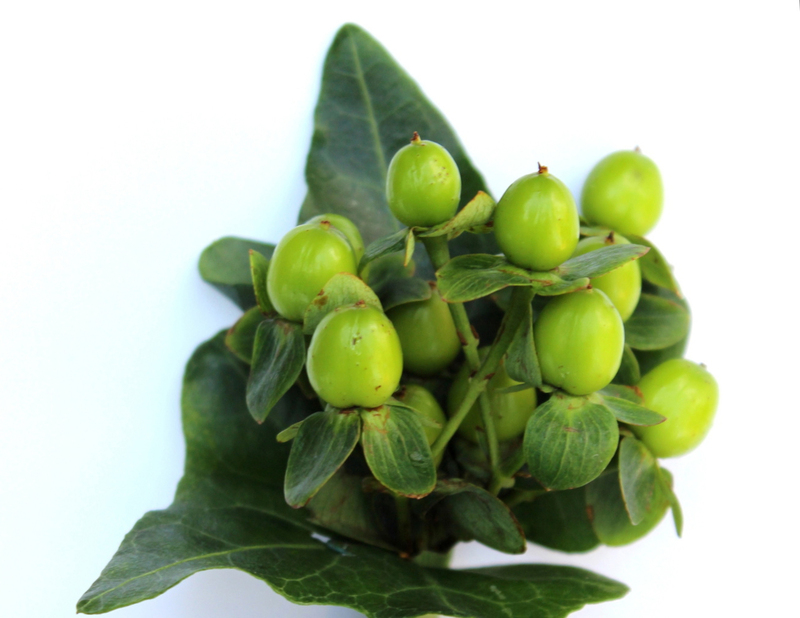 TEXTURE – Use interesting filler flowers like hypericum, and deep burgundy blooms. Scatter them evenly throughout the arrangement. 5. 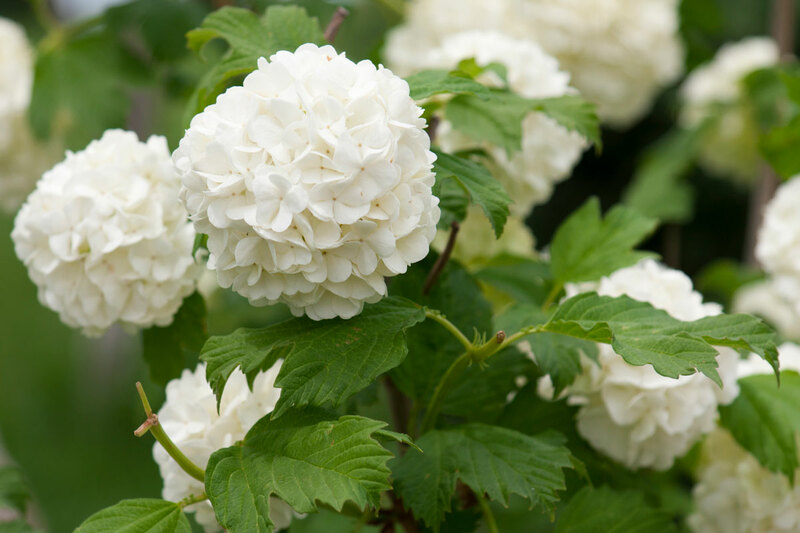 STAR – Choose one star flower—we love white hydrangeas for their volume and year-round availability. Place them in a balanced pattern. They should feel intentional, but not too perfect or precious. Remember to keep the blooms low enough to not obstruct conversations across the table! 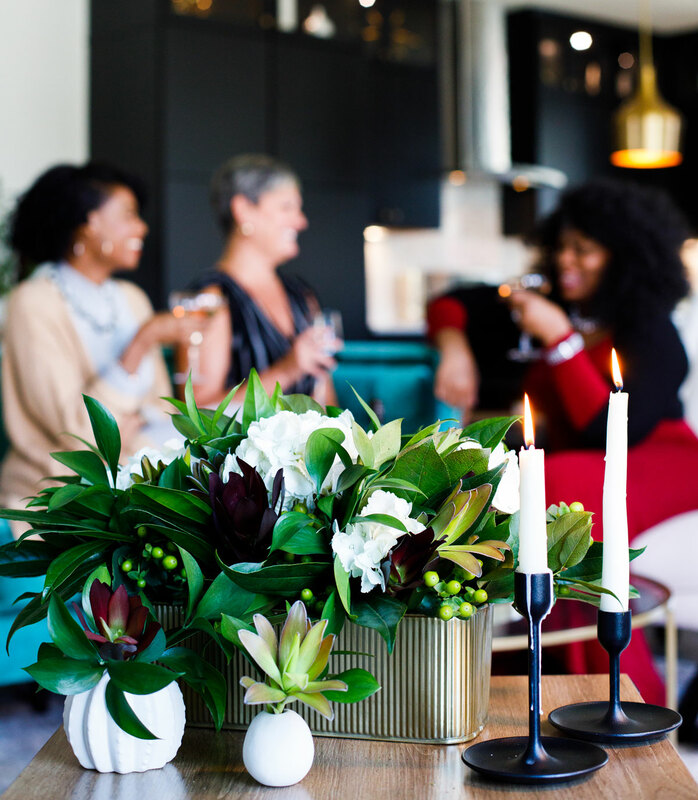 Check back next week when we share holiday hosting must-haves for your home. We shared this story with you in our Fall/Winter 2018 Issue of NEST Magazine. To view the full issue, click here.